Get an elegant flower bouquet rich in colour and unique in design. Nothing will delight your loved one more than the paradisaical collection of fresh chrysanthemums, carnations, roses and daisies. This flower bouquet is a spectacular sight. 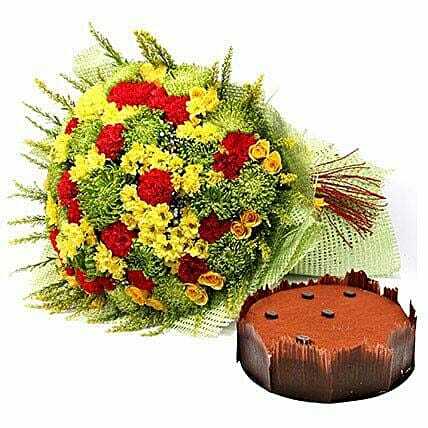 Light up any occasion with this bouquet of flowers and a super smooth Tiramisu cake. Send this gift hamper and make your loved ones feel their importance in your life. Meaning of flowers: Yellow roses sends across a joyful message, daisies means purity and innocence, red carnations symbolize love and admiration and chrysanthemums are a symbol of joy.